Product prices and availability are accurate as of 2019-04-21 02:00:30 EDT and are subject to change. Any price and availability information displayed on http://www.amazon.com/ at the time of purchase will apply to the purchase of this product. Our Spice Set of Premium Fragrance Oils include 1 - 10ml bottle each of: Cinnamon, Harvest Spice, Apple Cider, Coffee Cake, Gingerbread, and Pumpkin Pie oils. These oils are ready to use as perfumes or as an addition to your candle, soap, bath, or bodycare formulations. 6 - 10ml glass amber bottles with easy dispensing euro dropper (dropper inset in bottle) caps. 10ml = .33oz. Please see Product description for a listing of all oils included in this set. 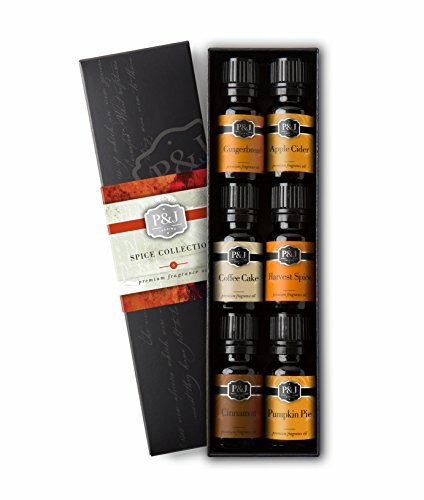 All Flash Points: >200 Our Spice Collection features 6 warm and vibrant premium fragrance oils delivered to you in a beautiful black gift box. P&J Premium Grade Fragrance oils are highly concentrated, enhanced formulations designed by our master perfumer. With more than 30 years in the industry, our master perfumer is certified by the IFRA. Uses include: all soap bases; candle waxes (works exceptionally well with soy wax); Perfume; unscented incense sticks or cones; baths; bodycare and haircare formulations; aroma diffusers; homemade cleaning products; or existing unscented products.